Before there was ever a Hamptons, rich and powerful Manhattanites flocked to a different body of salt water in the summer: the underground reservoir of Saratoga Springs. While most of the town is now more Middle America than Madison Avenue, pine trees and lakes can be a welcome break from sun-drenched beaches and packed night clubs come mid-July. The town's namesake, naturally occurring carbonated mineral water that bubbles from the ground, was the area's first and main attraction. The Iroquois Indians believed the Springs held magical healing properties and the hordes of wealthy land barons and bankers that came to soak their well-fed flesh in what was dubbed "The Queen of Spas," seemed to believe it. Modern-day physicians confirm that, yes, soaking in warm mineral water feels good, which you can still do in the Saratoga Spa State Park, where the historic Lincoln Baths have received a modern makeover. Take your luck to the track, box your exactas and trifectas and place your wins, places and shows. At one of America's most idyllic tracks, you can almost feel the ghosts of the New Yorkers who frolicked here in the 1800s. The season runs on all four legs from July 23 through Labor Day. 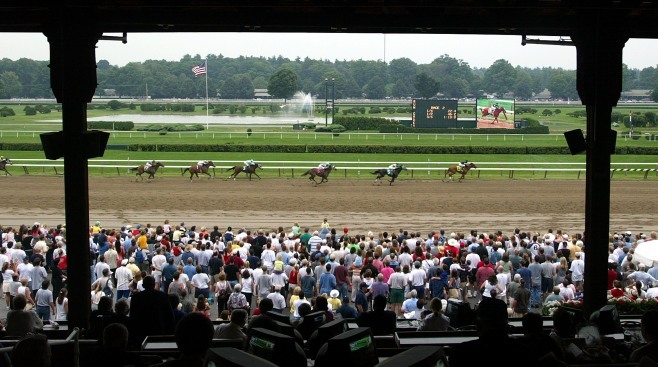 The Travers Stake, the biggest race of the year, and the oldest thoroughbred contest in the country, will be held on August 28. The New York City Ballet takes their final bow for 2010 at Lincoln Center on June 27, but for the month of July, the company revisits their repertoire on the breezy, open-aired stage at Saratoga Performing Arts Center. Tutus and point shoes make way for guitar stands and steel drums later in the summer when the likes of Sting, Maroon 5, O.A.R and Tom Petty take the stage. Bask in the sun and stars in the cheap seats (not really seats, just a blanket if you bring one) on the lawn, or pay for the pricey (but covered) amphitheater seating. For a place to lay your head, rough it at one of the State Parks nearby (actually, they have showers, electricity and toilet paper, so it's not that rough) or stay at one of the historic B&Bs in town.